On May 13, 2014 the United States Court of Appeals for the Fourth Circuit heard oral argument for the first time on the constitutionality of whether gay and lesbian couples have the right to marry. The case was heard by a three-judge panel including: Judge Henry F. Floyd, appointed by President Barack Obama, Judge Roger L. Gregory, first appointed in recess by President Bill Clinton then renominated by President George W. Bush, and Judge Paul V. Niemeyer, appointed by George H.W. Bush. In the News: AFER marriage equality case makes headlines. 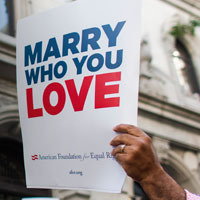 On July 28, 2014 the U.S. Court of Appeals for the Fourth Circuit affirmed that Virginia’s marriage ban is unconstitutional because it violates the Equal Protection and Due Process Clauses of the Fourteenth Amendment to the United States Constitution. The decision was monumental as it also paved the way for West Virginia, North Carolina, and South Carolina to strike down their marriage bans as those states fall under the jurisdiction of the U.S. Court of Appeals for the Fourth Circuit. In the News: 4th Circuit affirms Virginia marriage ban unconstitutional.